Please review your lines for your assigned Act! We will start Act 1 tomorrow!! Review the lines from your Act. ​Bring in your props. Remember the spirit and intentions of your character. Be ready for a quiz on Act I on Thursday. Woohoo! Review the four types of writing styles. Please bring in props for your character or for your team. Tomorrow the fun will begin. HW: Fill out your form (you will have time in class on Thursday to work) It will be due on THURSDAY. Be sure to review your Act of the Play and fill out the entire form-- Fill out your form for YOU. Woohoo. Scene questions are answered here. Act 1 Athens - Palace of Theseus & Quinces's home. Act 3 The woods & another part of the woods. Act 4 The woods and Quince's home. NOTE: Quince is missing from Act 5's original print out. Please add him in. BOOK SPIN THIS THURSDAY. . . PRINTED COPY OF YOUR OUTSIDERS PAPER DUE THURSDAY. Check out your assigned ACT and review your section of the play. Here is a link to a digital version of the play. Make sure you finish The Outsiders. If you have notes for your chapters and topic you will be rewarded. The Outsiders Paper Notes if you want to type: just make a copy. Please have your Outsiders Theme Handout ready to turn in. Have at least one body paragraph for your essay, complete. Please have a copy of your Outsiders Theme handout complete and printed for class. Complete two body paragraphs for your essay-- set your paper in MLA format. Please make sure you have read to the end of the novel. Please take copious notes on one of the topics that we explored in class today OR a topic of your choice. Please finish reading and taking notes on The Outsiders. Here are the notes from today. ​Study your WOTD - Your Quest is This THURSDAY. Only period 3 : English: Take notes on Chapter 7 based on our discussion in class. Only Period 3 English: Finish taking notes on Chapter 8. Read and take notes on Chapter 9 in The Outsiders. ​WOTD QUEST is next Thursday!! Book Spin is Tomorrow-- 60 seconds, your book. Read and annotate CHAPTER 7 in The Outsiders. Review the WOTD for the quest next week. WOTD QUEST is next Thursday!! Review your WOTD as we will be having a quest in 2 weeks. Don't forget to bring your Outside Reading Book as well! Book Spin is next TUESDAY. WOTD QUEST in TWO WEEKS. Please read and annotate Chapter 2 in The Outsiders. Consider what the girls add to the novel? What do they do to the plot of the story? Why are they important? Or are they? Book Spin will be in TWO WEEKS. . . keep reading for fun! Book Spin in TWO WEEKS. ​Don't forget to bring your ORB book for class tomorrow! Click here to access the Rubric for your presentations. Practice, practice, practice with a family member. Woohoo! Read Chapter 1 of The Outsiders and take notes on the major characters and setting. Don't forget to bring in that outside reading book!! And watched a TedX Talk: "Connected but Alone"
: Research Project - Research your team slides for our text The Outsiders. You should complete your content by Monday. The presentation will be due next THURSDAY. ​Don't forget to bring in an ORB by Monday too. Spelling Bee practice WORDS are here! Finish your group's Iron Poet AND have one copy printed out at the start of class. Enjoy your long weekend! Email Mr. Zollars if you have any questions with grades. Write and submit your final draft of your memory poem (make sure you copy the second draft and SAVE AS so that your final draft is independent from the second). You may re-add the five removed lines if you feel they are important to the rest of the poem. Included in your poem submission (from front to back): final draft, second draft, first draft, peer edits on checklist. Catch up for the end of the semester! ​Study for the Poetry Terms Quest on Thursday, Quizlet here! Please review the poetry terms for your poetry joy. Bring your ORB book as well! Poetry Party <--Check here for the memory poems! Memory poem checklist <-- Check if you do not have the paper copy from class! Write a second draft of your memory poem (make sure you copy the first draft and SAVE AS so that your second draft is independent from the first). Second draft must have FIVE lines removed but still at least 15 lines total (you may need to add a few more new lines). ​Due Monday. Peer Edit Rubric <-- Click Here! Print out final draft of The Giver essay with first draft, Super Chart, and peer feedback attached. ​Submit draft to Turnitin.com (see above for log-in info). Bring in your independent reading book tomorrow! Theme and Thesis Instructions <-- Click here! Super Chart <-- Click Here! Super Chart Evolution <-- Click Here! Finish first draft of The Giver essay (includes thesis statement and two body paragraphs with one claim for each paragraph, All quotations must be blended!) Print by start of class for peer edit on Tuesday. Here is a WOTD QUIZLET, thank you, Jayden!! Read and annotate Chapters 16 - 17 of The Giver. Please tell your parents about the new app we are Beta-testing: MINGA. Read and take notes on Chapters 13 - 15 in The Giver. HAPPY BREAK. . .. WOOHOOO! ​Review your WOTD LIST ​!! We have a quiz next Thursday!! Read and take notes on Chapters 7 & 8 for The Giver. Woohoo! Check out the two student samples of Literary Analysis paragraphs that followed the CEE format BELOW. Both of these samples are great because they addressed the CEE format, used MLA properly, embedded evidence and then analyzed the evidence. Remember that there is an annotation check. Check out the sample literary analysis papers below if you have questions about your scores. Be sure to check out your book The Giver in class. Read and take notes on Chapter 3. Bring in THREE copies of your horror story to participate in a Writer's Workshop on Tuesday. Print ONE final draft on your horror story -- BEFORE CLASS STARTS. submit your final draft to the Google Classroom as well. Next Thursday -- WOTD QUEST 2 - Get ready and study your words. Your Horror Story Mash-Up is due today! If you need to listen to the story again, click here. Here is a copy of "Harrison Bergeron"
HW: WORK ON YOUR CONCEPT AND MAYBE START WRITING. . . Remember, WRITING DAY 1 is ON TUESDAY. Use your assignment sheet to guide you! Here is a fun, quick read to inspire you! Five Writing Tips to Help Scare Your Readers. Watch the Twilight Zone Episode if you missed it. NEW. . .Work on writing 1 or 2 pages of your story. You will have a large block of class time to write on Thursday. Yes, you should start writing EVEN IF you did not have a stamp on your plotline. Work on your drafts for your horror mash up-- 3 PRINTED copies are due on TUESDAY. Revise your literary analysis body paragraph for class and print ONE copy to bring to class. We have one last day to revise. Woohoo! Revise your literary analysis body paragraph, SUBMIT IN GOOGLE CLASSROOM and have a print out for class on MONDAY. We will start our horror stories on Monday. . .
and thank you, Mia: Quizlet. Here's the AOW we discussed in class. Everyone: This is the last week to make up your Literary Terms Quest. Thursday is the last day. Pineapple pencil winner announced tomorrow! Here's the video from today. Please create a draft of your literary analysis paragraph and print it out for class. Remember that the assignment is posted in Google Classroom. Print & review this assignment sheet for Monday. Remember to review it--there will be a quiz! and spend 30 minutes on the discussion questions. Hey there! Check your literary terms quest online to see if you need to re-test. Email me: (jeannie.chufo@sduhsd.net) your paragraph by Wednesday night if you want to win. You only need one paragraph but it must be perfect. Write a one page response to the following article of the week. Yes, title your paper in MLA format. Yes, you should handwrite it ONLY. ​Remember that there is a Literary terms. Quest on THURSDAY. Woohoo! Bring in our ORB book too! Please read "All Summer in a Day" (Ray Bradbury). Be sure to mark up the figurative language & look up words you don't know. Please read "All Summer in a Day" (Ray Bradbury) - look up word you don't know. Practice your Literary terms. ​ for 30 minutes using Quizlet. ​​Bring in an outside reading book. WOTD: Review from last week. We watched this TEDx video by Mac Barnett around how books offer secret doors for us. Check out this film of the mongoose and a cobra. Write down one goal for the year on the index card I handed out in class. At the district office. Will not be at school today. Here is my back to school night presentation! Thank you, parents! WOTD: draggled, cowered, gait, archetype. We finished watching this TEDx video by Mac Barnett around how books offer secret doors for us. CP & HONORS HW: Practice your literary terms for 20 minutes on Quizlet. Have a section for English in your notebook & bring a free reading/outside reading book. Here is my first day of school presentation. 1- Do you remember how to head your paper in MLA format? 2-Ask your parents about the craziest parenting strategy they have tried on you. Did it work? Think of my whipped cream example. Bring in an English notebook. Take notes on Plotline from the images above. 1 - Review Plato's "Allegory of the Cave" if need be and how it relates to Plotline. 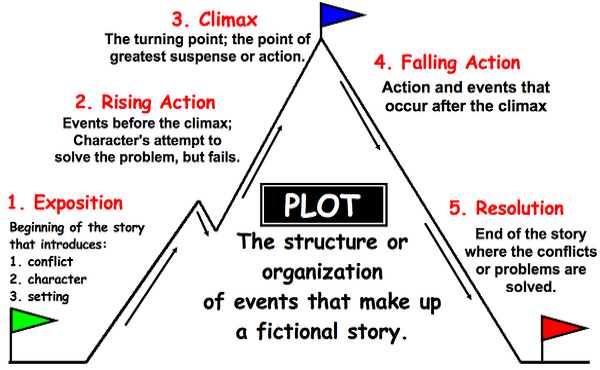 ​Fill out plotline chart with "Allegory ot the Cave"
quizlet.com/_54jtk4​- Play the quizlet on your literary terms 5 times for fun. Try the Matching game. ​At the District Office TODAY. Email Chufo if you have questions.